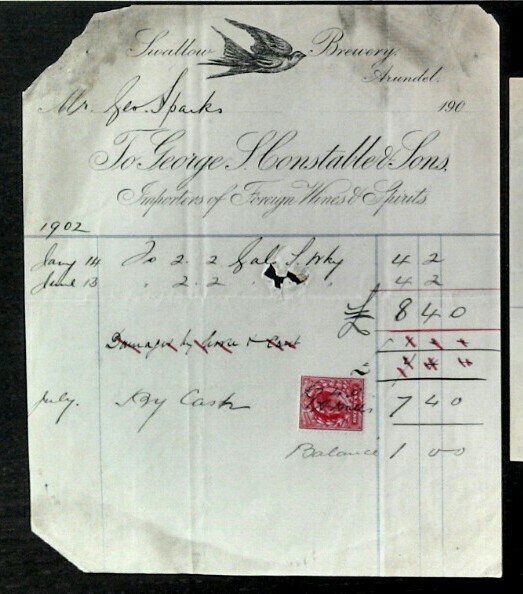 My interest in the long defunct Swallow Brewery of Arundel started when I discovered some old invoices of theirs on that popular auction site. Scrolling through the listings I came to a halt when I saw that these old-time papers were local history. Arundel is just 20 miles away from my hometown, Horsham, a real gem of a town in West Sussex and a great place to spend the day discovering the castle, the rowing lake, the wetlands and of course, the pubs. Pubs such as The Red Lion which was once the alehouse for that of Henty & Constable, the brewers that were responsible for the Swallow Brewery located on Queen Street. The brewery was one of many in the area- being a pretty rural place West Sussex didn’t get plumbed in to safe drinking water until relatively late, so the beer was safer to drink than the water and many families drank low abv beers instead. 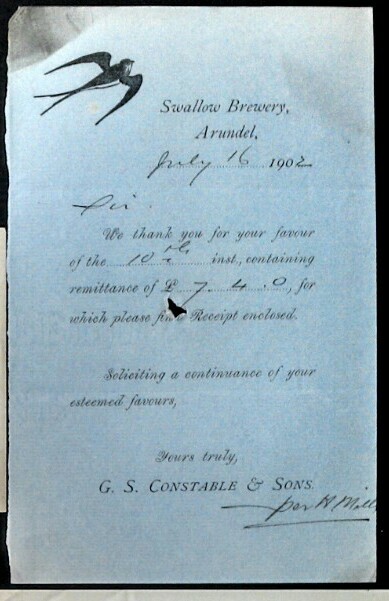 It was invested in by GS Constable & Sons Ltd in 1845 (George Sefton Constable eventually died in 1896) and was one of two breweries run by the company along with The Anchor of Littlehampton (whos production was switched to mineral water processing in 1917). The Swallow Brewery existed long before GS Constable with trade directory entries for the brewery dating back to 1783- the year of the French Revolution. 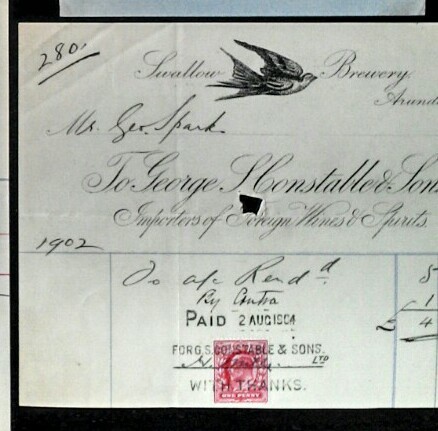 1921 saw a merger with Chichester’s G Henty & Sons to form Henty & Constable Ltd, although production soon came to an end when in 1922 the last beers were brewed and production was switched to Henty’s Westgate Brewery in Chichester. Henty & Constable ceased trading altogether in 1955 when the brewery was bought out by Watneys, with half of the properties being sold to Friary’s of Guildford. In the breweries heyday they were known for their Mild Ale, Special Ginger Beer, Extra Stout and a Milk Punch- said to be a favourite of Queen Victoria- a concoction of milk, lemon juice, sugar and rum, matured for 2 years. And although the brewery didn’t survive it’s amazing to think that these invoices and receipts did- they’ll be put in a frame soon, it seems a waste to hide them away. The decorative swallow that once swung from the brewery is also still in existence and still in the town, now located in the Town Hall. Sources: arundelbrewery.co.uk, thenovium.org, vennet-smith.com, arundelgal.blogspot.co.uk, books.google.co.uk – The Brewing Industry: A Guide to Historical Records. So interesting to see the receipts from the Swallow Brewery. My husband’s great great grandfather was George Sefton Constable so I have done a quite a bit of research into the family both in Arundel and the village of Warningcamp where the Constable family lived. So pleased to see something ‘real’ that still exists from the old family business. I would be interested if you ever came across my grand mother Mavis Clare Sefton Constable in your research. Hello Sarah, thank you for your comment. I may well do some further research into the brewery, if/when I do I shall keep an eye out for mentions of your Grandmother. I am a resident of Arundel and have dug up a bottle in the garden a clear tall bottle covered in vines and leaf embellishments with space on the front for a label. It has text around the base in capitals reading. Littlehampton Henty & Constable Ltd. It doesn’t look anything like a more modern beer bottle but from reading your article I am thinking its from 1921 during all the name changes. Or if it even is a beer bottle? Did they make other drinks, its very ornate for a beer bottle. Would love to know more about it, especially if there aren’t many about. Hi Lucie, after a quick bit of research , it could potentially date to the 1860s. It’s difficult to find much info on the bottle designs though unfortunately. If I find anything else I shall let you know. Good day! I have found a stoneware piece labeled GS Constable & Sons LTD Wine & Spirit Merchants Swallow Brewery Arundel that appears to be about a gallon in size and is two tone in color. do you have information on a piece such as this like dates or value? Hello! Thank you for getting in touch. Unfortunately I don’t think I can be of use. I didn’t find much information about the types of bottles the company used and so dating the bottle, for me at least, is difficult. All the (very little) information I found made it into this blog post. I wonder if there is a perhaps a local museum which may be able to provide a date for the bottle. Thank you and yes I will continue researching! Thank you for the information . I am currently trying to look into our family heritage. My grandmother was a Sefton constable connected to the brewery so this article was on great interest. Hi Stuart! Great to hear from you, this all sounds very exciting indeed! I’d be very interested in knowing how you get on with the yeast strains and I shall keep my eyes peeled for that Ginger Beer, I’m a fan of a proper ginger brew! !